What are the Best Natural Arthritis Remedies? An effective joint health supplement should contain natural nutrients that would quickly relieve painful arthritis inflammation while slowly rebuild degenerated cartilage, and increase flexibility, mobility, and range of motion. According to clinical researches, Boswellia Serrata is an effective anti-inflammation herb while Glucosamine, Chondroitin, and MSM are cartilage-rebuilding nutrients. Boswellia tree is from India and its extracted resin is used not only for inflammation conditions but also for lung diseases, diarrhea, reproductive disorders, and ulcer. One well-designed clinical study suggests that Boswellia and its bowellic acid constituent have natural anti-inflammatory properties that may help reduce arthritis inflammation and relieve arthritis pain. Boswellic acids have been shown to support healthy joint tissue, maintain circulation to joints, and enhance joint mobility in animal testing without known side effects. Boswellia seems to have the ability to switch off pro-inflammation cytokines and interrupt leukotriene synthesis. Leukotrienes are known to cause the initiation and progression of inflammation symptoms of many diseases. Another clinical study suggests that Boswellia have great value in relieving elbow joint pain, stiff muscle joint, and inflammation in a natural formulation that includes Boswellia, Turmeric (Curcuma longa), and Ashwagandha (Withania somnifera). At the end of the study, 93 percent of the 42 people taken the preparation in a randomized, double-blind, placebo controlled reported significant improvement in pain, disability, and joint health. Unlike conventional anti-inflammation NSAIDs (nonsteroidal anti-inflammatory drugs) such as ibuprofen, boswellia doesn't seem to cause stomach irritation, ulceration, headache, nausea, and hemorrhage as well as kidney damage. 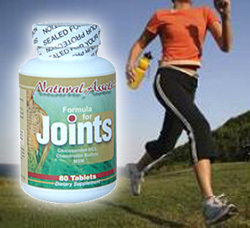 Boswellia along with other quality joint health nutrients are featured in Natural Assets' Formula for Joints. Click here for more information. A study was published in the February 2007 edition of the Indian Journal of Pharmacology about the effectiveness of Boswellia Serrata in osteoarthritis of the knee and compared to valdecoxib, a selective COX-2 inhibitor, in 66 patients over a period of six months. According to Sontakke, et al., the study author, Boswellia showed a slower onset of action, but the effect persisted even after stopping therapy. In contrast the action of valdecoxib became evident faster, but waned rapidly after stopping treatment.